6 tablespoons of unsalted butter. 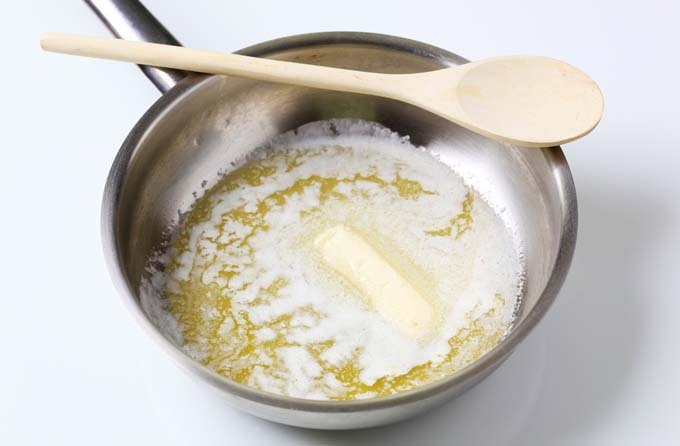 Note: salted butter works in a pinch – be sure to reduce the salt content of the overall recipe to compensate. 2 cups of milk (or stock if making a velouté). Note: the amount of milk can be significantly adjusted depending on the requirements of the overall recipe. For thinner white sauces 2 ½ to 3 cups can be used and for a thicker béchamel you may want to use around 1 ½ cups of milk. One other thing to consider is the amount of milk fat. The higher fat percentage, the thicker the sauce will be (which is why cream is also often used as basis for a type of white sauce). 1. Measure out your milk and heat in either the microwave or a saucepan. While the milk is heating, dose out your butter into a different saucepan and warm it over medium heat until it is fully melted. Keep a watchful eye on the butter and do not allow it to start to brown. 2. 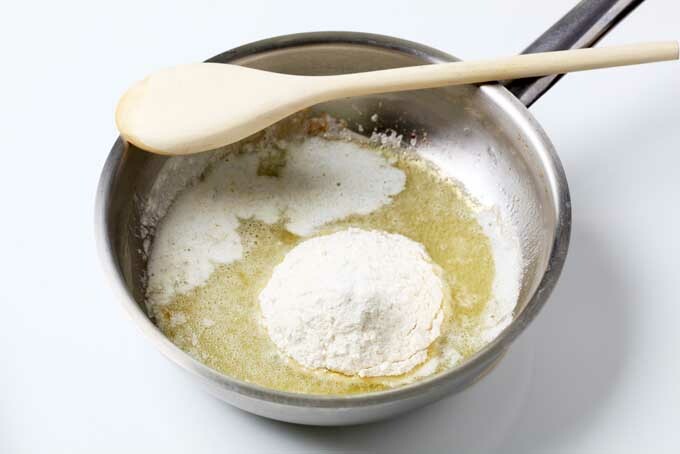 Stir the flour into the butter and cook over medium heat for around 4 to 7 minutes. This forms the basis of roux but be aware that you are not trying to create a Cajun style roux that is dark in color and nutty in nature. You merely want to flour to be just barely cooked – forming a “golden” or a blond type of roux. 3. Slowly add just a little milk – a couple of tablespoons at most. 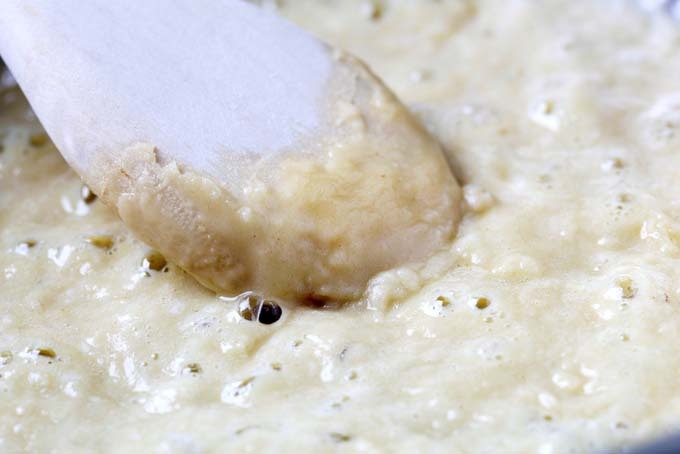 You should want the roux just a little moist so that it is a little more liquid. While stirring, allow to cook another minute or so and the slowly add the remainder of the milk while whisking. 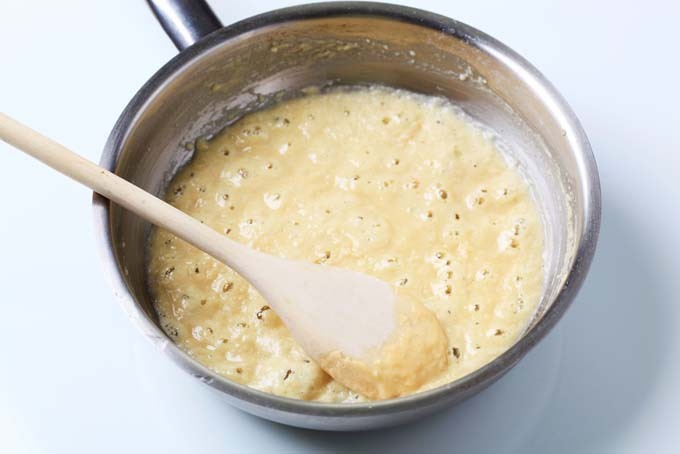 Be sure to keep a good pace while whisking or clumps may form – you don’t want a lumpy sauce. If you follow these steps, you should end up with a nice creamy concoction that will allow you to form a base to many different dishes, add some cheese and salt to taste for a pasta sauce, or even use by itself.